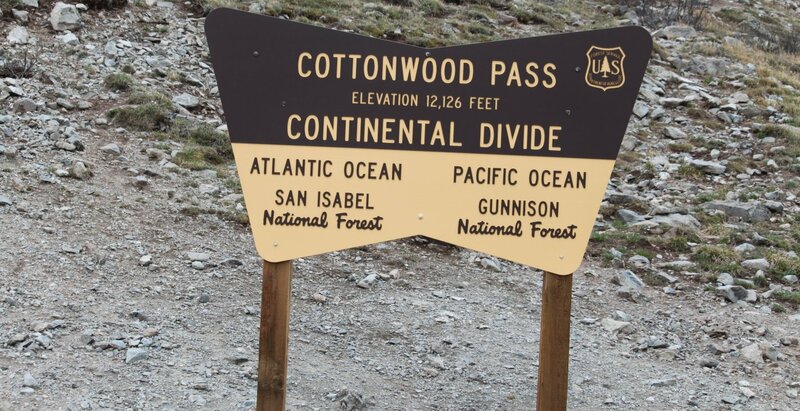 Among the many challenging and rewarding mountain passes to ride in Colorado, Cottonwood Pass has to rank as one of the biggest prizes. Starting at the traffic light in Buena Vista (7,920’), Chaffee County Road 306 (which begins as Main Street in town) ascends over 4,000 feet in 19.6 miles to Cottonwood Pass (12,126’) on the Continental Divide. This ride is very popular among local cyclists for the rigorous workout and grand mountain views. On most days, especially on weekday, the road tends to be relaxed with vehicular traffic. Although a grueling climb throughout, climbing the 11% grade for approximately one mile (above the Denny Creek Trailhead) is something to be ready for. At the top, you’ll the spectacular view of mountains on the other side of the divide. Bring your camera. Raise your bike in the air! Celebrate with friends. Cycling Cottonwood Pass is something to be very proud of. TIP: Be prepared for any kind of weather at the top. At 12,000+ feet, it can be 20-30 degrees colder and have very different weather than down in the valley. Bring gloves, extra layers and plenty of liquids.